Under the guise of World Cup fever, scientists across the globe are seizing the opportunity to examine the aerodynamic properties of what will in all likelihood be the most talked-about object on a global scale over the coming weeks, the 2014 World Cup match ball. The ball, lovingly named Brazuca by the Brazilian people, is the product of a significant amount of research and money aimed at creating the ultimate centerpiece for one of the greatest sporting competitions on Earth. You could be forgiven for thinking that a ball is in fact just a ball a glued, seamed construction of polyurethane, kicked around a patch of earth, incapable in itself of being a source of anger or discontent. Wrong. If you dig a little deeper into the surprisingly controversial history of the World Cup match ball, you will come to realize that every facet in the design of the little sphere has an effect on the way it behaves and moves through the air. Any oversight in this design can make the ball unpredictable as was the case with the late, lamented Jabulani, a ball which exhibited aerodynamic qualities so pronounced that it was described by Brazilian striker Luis Fabian as supernatural in its movements. The flight of a ball through the air involves a complicated mixture of aerodynamic forces. Explained at a basic level, when a ball is in motion a thin layer of air known as the boundary layer forms around the sphere. It is this boundary layer that most affects the behavior of a ball in flight. One of the aerodynamic effects that can alter the intuitive path of a ball is known as knuckling. This effect takes place when a ball is kicked with little or no spin, allowing the seams of the ball to channel the air in an unpredictable way, thus giving previous balls such as World Cup 2010's Jabulani their apparently supernatural movements. Because the ball has no initial spin, the path is dictated by pressure distribution over its surface, which is in a state of constant change. This creates an erratic fluttering motion. Adidas, the creators of the Brazuca, worked to combat the unpredictable nature of previous World Cup match balls by consulting with hundreds of active players, eventually settling on a number of techniques aimed at limiting the knuckling effect. The sports giant decided to increase the rough texture of the ball and to glue the Brazuca with six large panels compared to the eight smaller ones which made up the Jabulani. 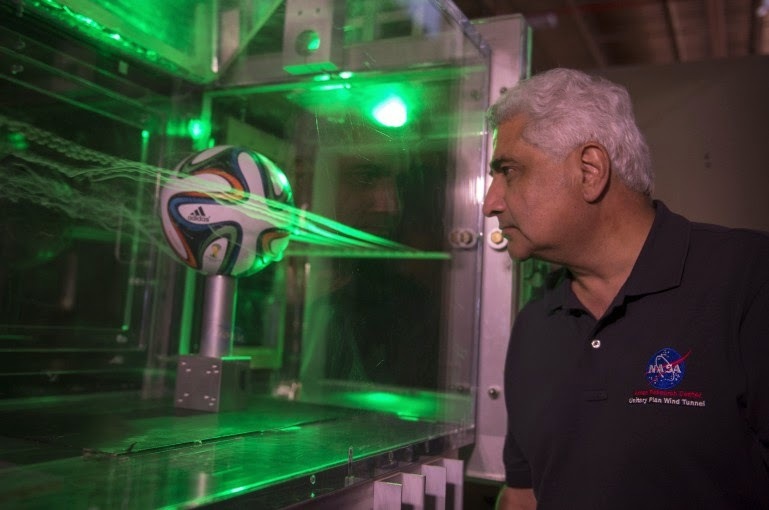 NASA scientists at the Ames Research Center tested the Brazuca using a wind tunnel and water channel, whilst using lasers and florescent dye to highlight and simulate the aerodynamic forces acting on the ball whilst in flight. "What we are looking for in the smoke patterns is at what speed the smoke patterns suddenly change," explained Rabi Mehta, chief of the Experimental Aero-Physics Branch at the Ames Research Center. "This is when the knuckling effect is greatest." It was found that the design of the Brazuca limited the optimal knuckling speed to only 30 mph (48 km/h), whilst the much smoother Jabulani knuckled at around 50 mph (80 km/h). This becomes relevant when considering that the average striking speed of a World Cup caliber player is 50 - 55 mph (80 - 89 km/h), almost exactly the same speeds at which the Jabulani becomes an erratic in-flight mess. Therefore, by restricting the Brazuca's knuckling speed to 30 mph, the ball becomes much more predictable for a goalkeeper to intercept. "The players should be happier with the new ball," states Mehta. "It is more stable in flight and will handle more like a traditional 32-panel ball." Researchers from MIT have also been analyzing the virtues of the Brazuca's rougher surface. It is believed that this move away from progressively smoother match balls will counter a little-known phenomenon called the Magnus Effect. This aerodynamic quirk causes a very smooth ball such as the Jabulani to bend in the opposite direction compared to a rougher ball struck by the same individual. As an example, imagine a right-footed striker taking a penalty with the current rough-coated Brazuca ball. He strikes the ball towards the outside creating the intuitive right-to-left hook in the trajectory of the ball. However, if the same shot had been taken using a very smooth skinned ball, the shot would have bent in the opposite direction. This surprising phenomenon is created by contrasting conditions in the boundary layer. 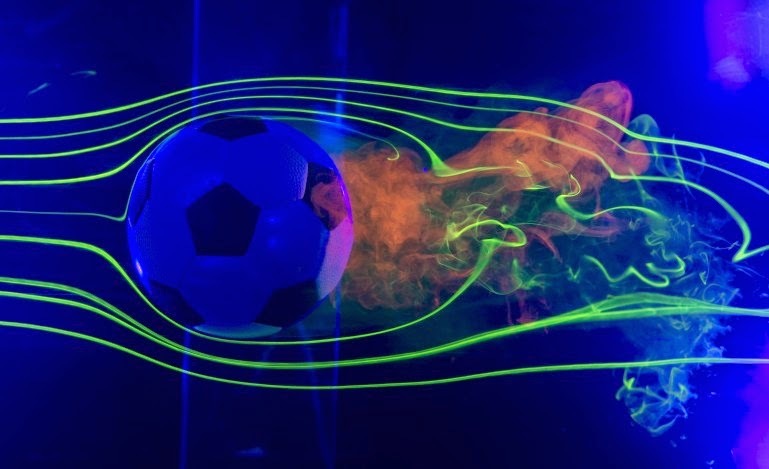 A smooth ball creates a predominantly laminar flow, causing it to move contrary to the expected path of the ball, however a rougher ball creates turbulence in the boundary layer, resulting in the ball behaving in a more predictable manner. The Brazuca has seams that extend 50 percent longer than its predecessor, creating a much rougher surface and therefore ensuring that the flight of the ball is much truer to the trajectory of a traditional 32-panel ball. In conclusion, next time you see a stunning shot arcing in from the edge of the penalty box, try not to simply think of a ball striking the back of a net, but instead quietly acknowledge the manifold aerodynamic forces at play, manipulating its path to glory. 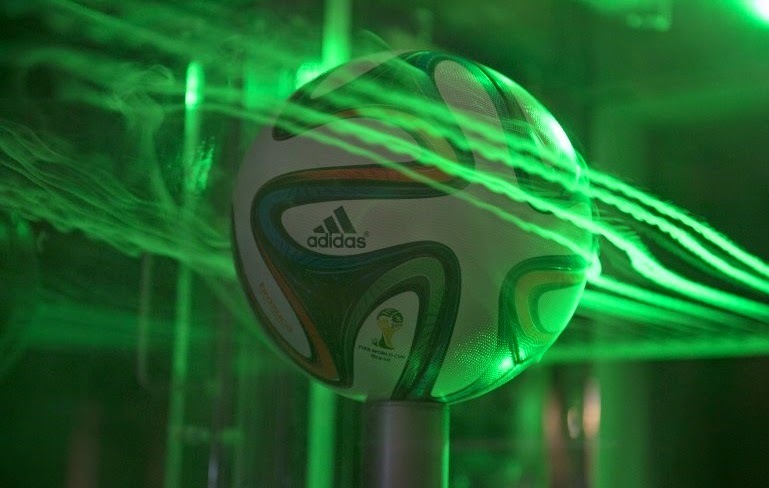 The video below shows some of the aerodynamic tests the Brazuca underwent at NASA's Ames Research Center.